produced by their own language. Today's short is "Samurai Song", a Robert Pinsky poem read by its author to accompaniment of music. The video is part of Pinsky's "The Art of Poetry" online course on edX; Pinsky conducted the eight-week course in 2014 in conjunction with Boston University. Among others are the poems "Gina Samba", "The Hearts", "Antique", and "Street Music". ✦ Elegance is a distinguishing characteristic of the beautiful, sculptural forms created by Australia's Meredith Woolnough, who came to my attention via FaceBook. Woolnough uses embroidery or other threads, pins, and glass rods on paper in a process all her own. Her work takes its inspiration from nature—ammonites, ginkgo, coral, ferns, leaves, water lilies—reflecting its beauty, fragility, and ephemerality. Imagine her work on the cover of a book! Woolnough's new work can be seen in a major exhibition opening in August at The Milk Factory Gallery in Bowral, NSW. ✦ A former bank in Chicago is slated to become Stony Island Arts Bank. Artist Theaster Gates, who is based in Chicago, paid the city $1.00 for the space, which will open during the Chicago Architectural Biennial (October 3, 2015-January 3, 2016) in which 60 international studios will participate. Gates talks about his project in this video (filmed in 2012). ✦ Paper artist Helen Hiebert offers a highly affordable array of paper weavings. 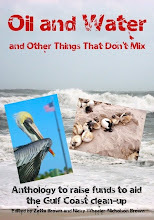 Don't miss her artists' books or the many interesting posts and videos on her blog. 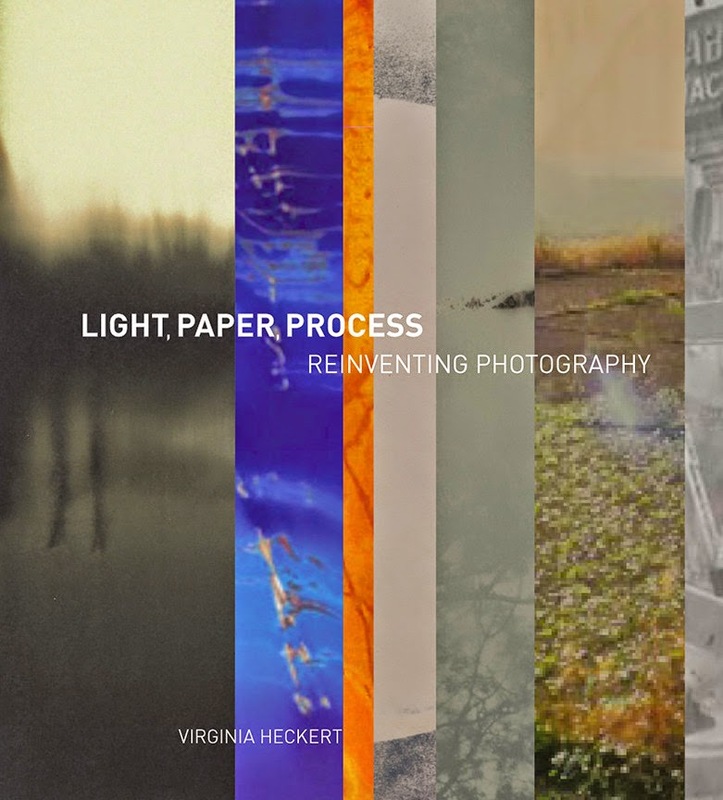 ✦ Smithsonian Libraries' Artists Books Collection is now online. It's a treasure! ✦ Spend some time in the natural world with fine printmaker Sarah Horowitz who, in addition to gorgeous prints and drawings, makes hand-printed and bound artists' books and collaborates with Tavern Books (one recent cover was for We Women by Edith Sodergran). Horowitz's imprint is called Wiesedruck. Watch an Oregon Art Beat profile of the artist. Horowitz's exceptional prints are available through Froelick Gallery, Portland, Oregon. ✦ The woven metal artworks of Michelle Mckinney are exceptional and exceptionally beautiful. McKinney, whose exhibition "Held" at Northcote Gallery, London, concluded in mid-April, recently began making "ghost editions" of her woven metal work; these are limited-edition, signed images; reimagined as negatives, they are printed with archival inks. They're eye-catching! ✦ InterVarsity Press has released J. Scott McElroy's Creative Church Handbook: Releasing the Power of the Arts in Your Congregation (2015). McElroy, founder of the nonprofit New Renaissance Arts Movement, addresses the use of live art, dance, media, film, and video; structuring and launching an arts ministry; establishing an artists-in-residence program in a church; working with outside artists; inspiring, empowering, and leading artists in church; interactive arts projects; and much more. ✭ In Washington, D.C., George Washington University's Luther W. Brady Art Gallery continues through July 17 "Art in the Making: A New Adaptation". The exhibition presents work by teachers and students of three New York City art institutions and their counterparts at GWU's Corcoran School of the Arts and Design. Work by Helen Frankenthaler, Jackson Pollock, Kit White, and others represents the New York City institutions; work by Gene Davis, Jules Olitski, and others represents the Corcoran School. ✭ Porcelain installations drawing on nature and technology are featured in "Dawn Holder: Several Collections of Commemorative Plates", continuing through July 19 at Ft. Smith Regional Art Museum, Ft. Smith, Arkansas. Holder's interest is in "the ways local populations alter, cultivate, and mythologize the landscape around them." In creating her installations, she uses utilitarian light-switch plates and outlet covers, assembling them in repetitive grids and enveloping them in porcelain flowers, creating a striking contrast between what we use and consume and how it affects our lives. Images of Holder's Sunset (2104), Sunset (2014), Value Scape (2014), and Sprout (2015), Street View (Dream Homes) (2015), and Compendium of Arkansas Plants (2015) are at the exhibition link above. ✭ The future as depicted in fantastic murals, digital prints, and drawings by Japanese pop artist Chiho Aoshima is cause to pause while visiting Seattle Art Museum's "Chiho Aoshima: Rebirth of the World". The ticketed exhibition of dreamscapes, continuing through October 4, imagines both darkly and surrealistically the artist's vision(s) of how reality might look as the world grows older. ✭ A show of contemporary artists — emerging, mid-career, and established — connected to Cleveland, Ohio, and cities in Pennsylvania and Michigan opens June 12 at Cleveland's Museum of Contemporary Art. On view through September 6, "How to Remain Human" is described as an expansive, immersive look, through a wide variety of media, of what it means to be of, acting in, and experiencing the world. A series of public programs complements the exhibition and a comprehensive catalogue with commissioned essays on each artist will be available for free download once the exhibition begins. Images may be viewed at the exhibition link. 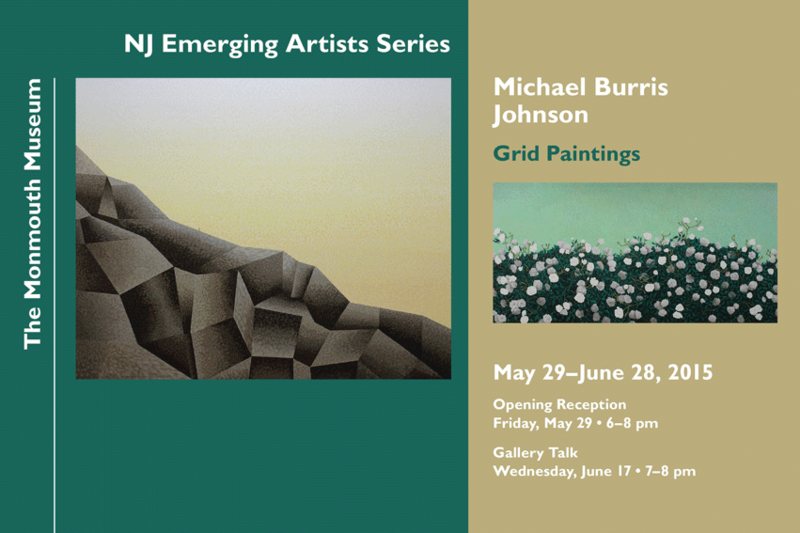 ✭ Opening today at Monmouth Museum, Lincroft, New Jersey, is "Michael Burris Johnson: Grid Paintings". The show, which continues through June 28, is part of the Monmouth's "NJ Emerging Artists Series". In his Artist Statement, Johnson says, "Each painting conjures an image from deep silent regions of existence, pulled from under the heart. There is an effort to find passage—beyond memory, past the senses' horizon—to pass through a rigid structure and hold in tact an honest affirmation of life." See images of Johnson's Grids at his Website. Depicted in the promotional image above at Sisyphus (at left) and Patience. These are lovely oils on canvas. Bread, freedom, social justice. . . These were the goals of the 2011 revolution known as Arab Spring. In director Gini Reticker's The Trials of Spring (Fork Films, 2015), a multimedia initiative comprising six shorts, the role and stories of women agitating for social change and civil rights in Tunisia, Egypt, Libya, Yemen, Bahrain, and Syria, are brought to vivid light. Below is the trailer for the film, whose world premiere takes place June 12 at the Human Rights Watch Film Festival in New York. Today's wonder is a fly geyser in Black Rock Desert in Nevada. It is, according to Friends of Black High Rock, human-made, the result of test drilling for water in 1964. The geothermal test well was not capped properly; calcium carbonate deposits left behind when scalding water issued forth then built up over the years. The colors are from algae on the deposits. The video was taken from the sky, because the geyser is on private property. Even though is not a natural phenomenon, it's impressive and beautiful. strands stretched to breaking point. skins of your trampolining bodies. the cords of your three-sided parachutes. This poem is a response to this past week's news articles about the "rain" of millions of spiders in Australia's Southern Tablelands. The spiders' linked webs produced a landscape that seemed to be covered in snow. The phenomenon observed is called "ballooning". It is truly a natural wonder. Read "The Science Behind Australia's Spooky Spider Rain" in The Washington Post, May 19, 2015. Articles also appeared in National Geographic magazine and The Oregonian, among other news and science publications. As I did in 2014, I am committed in 2015 to reading as many books by women as I can. Below are writers (some, such as Chana Bloch, Judith Ortiz Cofer, and Kate Schmitt, are new to me) I've read since the start of the year and recommend. Join in the project and share online and promote your titles using the hashtag #readwomen or #readwomen2015. ✭ Barbara Crooker, Selected Poems (FutureCycle Press, 2015) Read my review. ✭ Dawn Potter, A Poet's Sourcebook (Autumn House Press, 2013) Read my review. ✭ Kate Schmitt, Singing Bones (Zone 3 Press, 2014) Read my review. ✭ Kelly Cherry, Twelve Women in a Country Called America: Stories (Press 53, 2015) Read my review. Read Elena, "Why #readwomen2014 Has Changed Things, and Why #readwomen Matters", December 22, 2014.
to simplicities of public conversation. 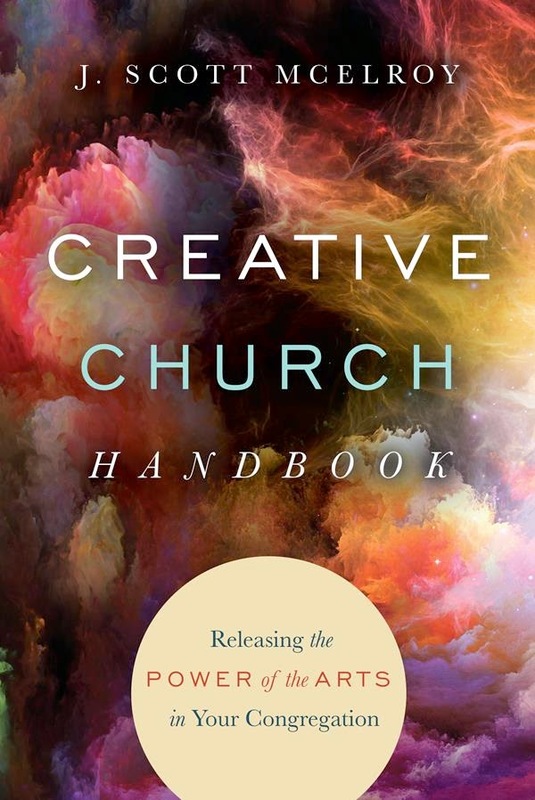 Brooks's most recent book is The Road to Character (Random House, April 2015). Visit The Road to Character Website. Today's short, from KQED's "Deep Look" science series, explains how hummingbirds fuel up and fly. A high-speed camera was used to film the birds. Additional information about hummingbirds is found at the KQED blog. ✦ Artist Rafael Rozendaal has a new project, Abstract Browsing, which uses a free Google Chrome plugin to turn Websites into colorful compositions that can be turned on or off instantly. Read Rozendaal's interview at DIS Magazine. See more of Rozendaal's Websites. ✦ Textiles, paper ephemera, paint, embroidery, and sometimes photographs are the principal materials for Laura Edgar's artworks. Edgar specializes in embellished fashion fabric design and offers a wide range of hand-made products. She also conducts workshops in textile arts. ✦ Open a window into painters' palettes, a series, Das Meisterstuck, by Matthias Schaller. ✦ The Feather and Bone series (2013-2014) by mixed-media artist, surface design teacher, and author Jane Dunnewold of San Antonio, Texas, began, according to Dunnewold, as photographs. These beautiful assemblages invite a closer look. Also see her series The Lyrical Thread (2012), Etude (2011), and Sacred Planet (2009-2010). Visit Dunnewold's Gallery, too. Watch an informative talk Dunnewold gave in 2013 for The McNay Art Museum's "Artists Looking at Art" program. She addresses the importance of daily practice, as well as her process and techniques, what she calls "the projected story" that informs her art-making, and her deep appreciation of the natural world. ALA: Jane Dunnewold 6-13-13 from The McNay Art Museum on Vimeo. ✦ The hour-long BBC documentary Moominland Tales: The Life of Tove Jansson is wonderful. Jansson (1914-2001) was a Finnish painter, illustrator, novelist, and comic strip author. 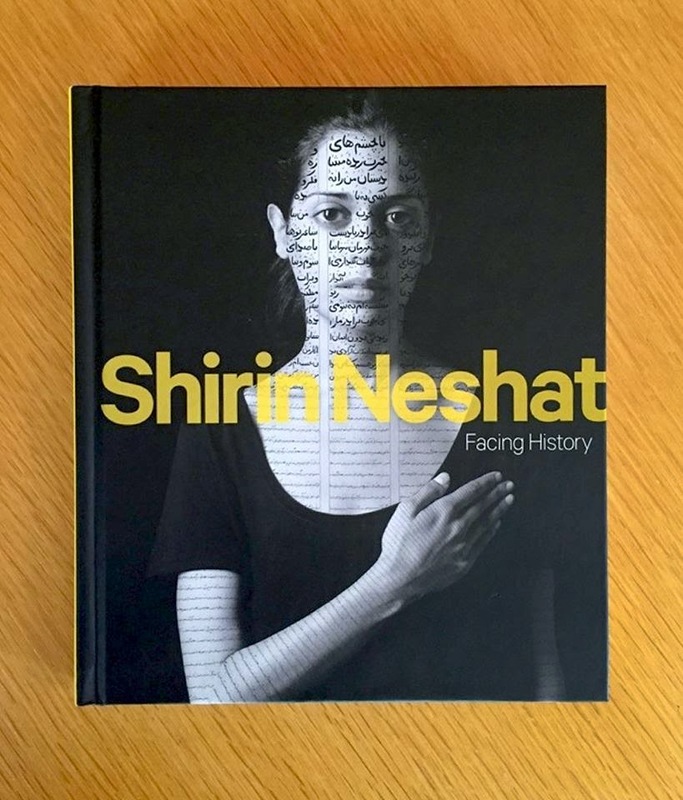 ✭ "Shirin Neshat: Facing History" has opened at Hirshhorn Museum and Sculpture Garden, Washington, D.C. The exhibition, which runs through September 20, features Neshat's series of photographs Women of Allah, which first brought the artist to international acclaim; her lyrical and mesmerizing video installations; and two monumental photographic series, The Book of Kings (2012) and Our House Is on Fire (2013). A catalogue of the same title as the exhibition (see image below), published by Studio A, Alexandria, Virginia, accompanies the show. Watch "Shirin Neshat: Art in Exile" on YouTube. Also watch Neshat's TED Talk. ✭ The National Gallery of Art, Washington, D.C., continues through September 13 "The Memory of Time: Contemporary Photographs", a selection of work acquired by the museum with the Alfred H. Moses and Fern M. Shad Fund. Divided into five sections — "Traces of History", "Time Exposed", "Memory and the Archive", "Framing Time and Place", and "Contemporary Ruins" — the exhibition showcases 76 artworks from the early 1990s to the present. Among the 26 international artists featured are Idris Khan, Chuck Close, Adam Fuss, Carrie Mae Weems, Vera Lutter, and Uta Barth. Eleven images are available on the exhibition page. Carrie Mae Weems will deliver "The Diamonstein-Spielvogel Lecture" in September. A catalogue accompanies the show (see image below). ✭ Drawn from collections about ballet, modern dance, opera, musical theatre, comedy, dramatic theatre, and variety theatre, "Grand Illusion: The Art of Theatrical Design", continuing through July 25 in the Performing Arts Reading Room Gallery of the Library of Congress, presents finished renderings, works in progress, technical drawings, and designers' research materials on theatre production. Also featured are correspondence among designers and collaborators about scenery, costumes, and lighting. Some designers whose work is included are Robert Edmond Jones (1913-1943), Frederick Loewe (1901-1988), Tony Walton, and Boris Aronson. ✭ The Textile Museum, at The George Washington University, Washington, D.C., is presenting through August 9 "Unraveling Identity: Our Textiles, Our Stories". The largest exhibition in the museum's history, the show features more than 100 textiles covering 2,000 years and five continents. Items on display including clothing, adornments, and fabrics with personal, cultural, political, and social implications. A print catalogue (see image below) is available as a downloadable digital publication (pdf). 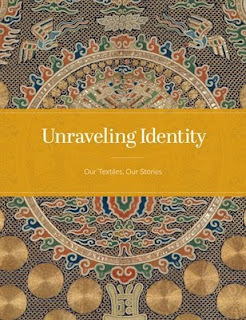 View online "Unraveling Identity" at ISSUU (an exhibition gallery guide) and "Identity Markers" (expanded label information). 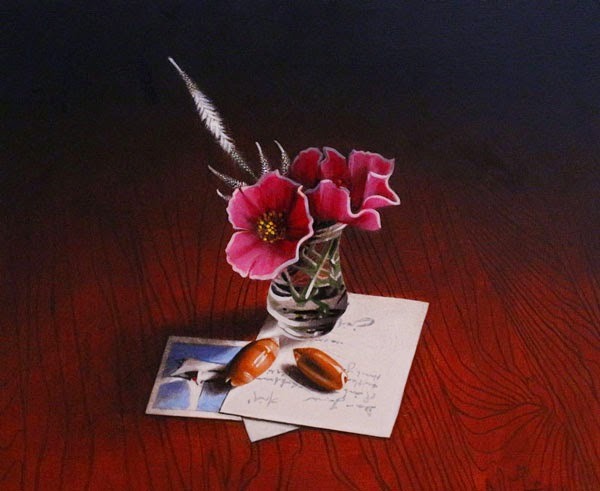 Kay Juricek, Letter, Acrylic on Board, 10" x 12"
You'll find me at Escape Into Life today, where I've posted a new Artist Watch column featuring the still lifes of Kay Juricek, of Denver, Colorado. Inspired by the beauty of her garden and her many collections of cherished objects, such as seashells and glassware, Kay paints with an eye for colors and shapes. To view her work is to experience a moment of quiet and stillness. My Artist Watch feature includes images of seven of Kay's still lifes, her Artist Statement, and a brief biography. Currently, Kay is studying with Denver painter and teacher Kevin Weckbach. She is a former student of renowned Nebraska landscape artist Keith Jacobshagen. Here's a preliminary look at a new documentary, Troublemakers: The Story of Land Art, from curator and art historian James Crump. Directed by Crump, the 72-minute film, currently screening, addresses the emergence of "land art" in the late 1960s and the artists, including Robert Smithson (Spiral Jetty), Walter De Maria (The Lightning Field), and Michael Heizer (Double Negative), whose seminal works "transcended the limitations of painting and sculpture" and are most closely associated with the genre. Read Su Wu's "A New Documentary Sheds Light on the 'Troublemakers' of Land Art", T Magazine, May 4, 2015, where the trailer first appeared. three decks of off-balanced cargo. leads but one way; Europe's another. We can say that eight hundred are dead. They float like Ophelia: volte-face. They are Eritreans, Syrians, Somalians. Ivory Coast, Sierra Leone, Bangladesh. you stop the deaths is, you stop the boats. arms. Their captain: he survives. We brought flowers to remember. * A dead goat doesn't fear the butcher's knife. I wrote this poem in response to the horrible loss of life—some 800 are thought to have died—in the Mediterranean Sea, where a boat with smuggled migrants sank off the Libyan coast. The sentences in italics are direct quotes found in a variety of news stories, including excellent coverage abroad, especially in The Guardian and Telegraph. Hundreds continue to die as they try to make their way from Africa, across the Mediterranean, to sanctuary in Europe, the continent that does not want them. The poem was published at Philadelphia Review's Philly Books & Culture blog on May 6. 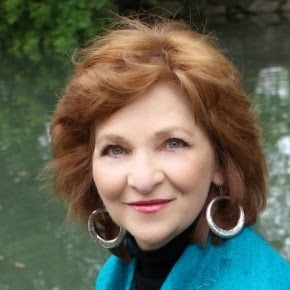 The new Poet Laureate of Texas is Carmen Tafolla, whose one-year appointment was announced earlier this month by the Texas Commission on the Arts. Tafolla also holds the honor of first Poet Laureate of San Antonio, Texas; appointed to that post in 2012, she served two years, during which time she appeared at more than 300 schools, universities, conferences, and community arts centers. In addition, she created SA PoetSource, part of her "Signature Series of Initiatives" developed with the City of San Antonio's Department for Culture and Creative Development. The National Association of Chicana and Chicano Studies cites Tafolla for "giv[ing] voice to the peoples and cultures of this land." The National Latino Book Club named Tafolla's collection This River Here its October 2014 "Book of the Month". The highly accomplished Tafolla succeeds Dean Young in the honorary position. The process of selecting and appointing an incumbent is explained in my Monday Muse post dated June 21, 2010, covering the appointment of native Texas Karla K. Morton. As in other positions she has held, Tafolla as state Poet Laureate aims to improve literacy through increased access to literature and literary arts, foster appreciation of cultural diversity, and promote the reading, writing, and enjoyment of poetry throughout the state. Native Texan Carmen Tafolla, Ph.D., is a poet, storyteller, performance artist in the United States, Europe, New Zealand, and Mexico, motivational speaker, and university professor. She has published more than 20 books. Her most recent poetry collections are This River Here: Poems of San Antonio (Wings Press, 2014) and the bilingual Rebozos (Wings Press, 2012). The latter was awarded three International Latino Book Awards First Prizes (Best Book of Poetry, Best Gift Book, and Best Art Book); it contains images of the paintings of Catalina Garate Garcia, which were the inspiration for Tafolla's poems. A 30th Anniversary "Banned in Arizona!" Edition of Tafolla's highly regarded Curandera (M&A Editions, 1983; Wings Press, 2012) was republished three years ago with a new introduction by photographer Norma Cantu, who writes that "[t]he power of the words in Curandera transcends the pages and reaches into the heart." Tafolla's other poetry collections are Sonnets and Salsa (Wings Press, 2001, 2004, 2006, 2011), which has been translated into German, and Sonnets to Human Beings and Other Selected Works (Lalo Press, 1992; Reissue, McGraw-Hill, 1995; available via resellers), which includes Sonnets to Human Beings and a selection of other poems, as well as a number of stories, an autobiography, and critical and interpretive essays. With co-authors Cecilio Garcia-Camarillo and Reyes Cardenas, Tafolla published a debut poetry collection, Get Your Tortillas Together, in 1976. Other work by Tafolla includes children's picture books (Tricycle/Random House), television screenplays, song lyrics, nonfiction (a biography about civil rights organizer Emma Tenayuca, That's Not Fair: Emma Tenayuca's Struggle for Justice), short stories, and a feature film comedy co-written with Sylvia Morales. Tafolla's work has been translated into five languages, including Bengali, and included in elementary school readers, high school and university textbooks, newspapers, and magazines. Place, especially the barrios of San Antonio where she grew up, and ancestry are strong and prominent themes in Tafolla's poetry, which also reflects a profound awareness of social injustice and a deep knowledge of the cultural heritage she shares with the Latina/o and Chicana/o communities. Subjects such as identity, culture, language, and women's strength and self-empowerment in the face of entrenched poverty, sexism, racism, and other discriminatory and adverse social ills can be traced throughout her work. you'll never get it at that price anywhere else!" she says to her young sister. how shall I tell you that I love you then? Poems by Tafolla have been published in a lengthy list of literary journals and anthologies, including Voices de la Luna (a quarterly poetry and arts magazine), Before/Beyond Borders: An Anthology of Chicano/a Literature, Ventana Abierta, NewVerseNews, Swirl, Frontiers: A Journal of Women's Studies, The Langdon Review of the Arts, Texas in Poetry: A 150-Year Anthology, Puerto del Sol, and The Texas Observer. Among Tafolla's many and varied honors and distinctions, which she began receiving as early as 1976-1977, are the Americas Award (2010), five International Latino Book Awards (including Best Book of Bilingual Poetry, 2013), two Tomas Rivera Book Awards (2009, 2010), two ALA Notable Book Awards, a Texas 2 by 2 Award, and the Charlotte Zolotow Award (2010), Art of Peace Award (St. Mary's University, 1999), and Top Ten Books for Babies (Fred Rogers Corporation). Tafolla also is in the San Antonio Women's Hall of Fame (since 2009) and is a member of the Texas Institute of Letters (1999), which cited her for outstanding literary achievement. An educator who has held numerous faculty and administrative appointments, including positions at California State University at Fresno, Texas Lutheran College, and Northern Arizona University, Tafolla lives in San Antonio. She was formerly Writer-in-Residence for Children's Youth, and Transformative Literature, University of Texas at San Antonio, where she established Cuentos y Carino (Bilingual Bedtimes), a UTSA project to encourage parents to read to their children. Currently, Tafolla is an associate professor of practice in UTSA's College of Education and Human Development's Department of Bicultural-Bilingual Studies. Also see "Carmen Tafolla: A Life in Letters Documentary", a biographical video. Canto Mundo published the press release announcing Tafolla's appointment as San Antonio's Poet Laureate. An excellent separate Website, Carmen Tafolla Performance and Resource Site, created in collaboration with Wings Press, features seven of Tafolla's poems ("The Magic", "La Malinche", "Marked", "Mujeres del Rebozo Rojo", "Right in One Language", "This River Here", and "Voyage"), videotaped readings, book trailers, and textual resources and curricular aids, as well as public presentations and writing exercises. Carmen Tafolla's poems also can be found on Tumblr. See also "The Poet Laureate Film Project"; coordinated by Three Chord Media, it is designed to celebrate Tafolla's poetry. For the project, six filmmakers, including Daniela Riojas, visually interpret her poems. that are in front of you. . . .
Mark Doty's most recent poetry collection s Deep Lane (W.W. Norton, April 2015). Today's video offers a brief look at classical Cambodian dance. It is narrated by Charya Burt, who was trained in and taught her country's traditional dance but was forced to leave her homeland during the reign of the Khmer Rouge. Burt now lives in San Francisco's Bay Area. ✦ A solo exhibition "Rara Avis" (continuing through the end of the month) at The Athenaeum in Alexandria, Virginia, sent me to the Website of Beverly Ress, who creates structural and cut drawings that show Ress's strong affinity for forms found in science and mathematics, as well as highlight her technical skill and meticulous attention to detail. Her work, which can be found in collection of The Library of Congress and Amnesty International, among many others, rewards with every look. ✦ Can you guess which of these Richard Siken paintings and photographs I favor? Siken also is an award-winning poet (Crush and War of the Foxes) and a filmmaker. In this interesting interview with Kathleen Rooney at Poetry Foundation, Siken talks about both writing and painting and what each brings to his life. ✦ Cheesecloth might seem an unusual art material; in the hands of Canadian fiber artist Mary Pal, it becomes a unique and beautiful portrait. The internationally exhibited artist is found at Mary Pal Designs. Pal offers two-day workshops during which participants learn some of Pal's methods and techniques. ✦ Below is a short video introduction to the recently concluded exhibition of Hiroshi Sugimoto sculptures and photographs at The Phillips Collection, "Hiroshi Sugimoto: Conceptual Forms and Mathematical Models." ✭ The North Carolina Museum of Art, in Raleigh, is presenting through August 23 "The Patton Collection: A Gift to North Carolina". The exhibition draws from an extraordinary collection of art, which includes works by Milton Avery, Richard Diebenkorn, Helen Frankenthaler, Ellsworth Kelly, Robert Motherwell, Frank Stella, Wayne Theibaud, and many others, donated to NCMA by James and Mary Patton, North Carolina natives with a passion for art. View a slideshow. Read James Patton's March 2015 interview with Liza Roberts for Walter magazine. ✭ Chicago's Catherine Edelman Gallery offers an installation of gorgeous photographic work by Ysabel LeMay. Based in Austin, Texas, LeMay first worked in advertising as a graphic artist; she took up painting in 2002 and eight years later turned to photography, in particular nature photography. The solo exhibition, "Ysabel LeMay: Wonders", featuring LeMay's lush and beautiful digital chromogenic prints, runs through July 3. Portfolios of her work may be seen on LeMay's Website and at Thomas Riley Studio. ✭ A show of Marilyn Minter paintings, photographs, and videos continues through August 2 at Contemporary Arts Museum Houston. On view in "Marilyn Minter: Pretty/Dirty" are 25 paintings from 1976 to 2013, three videos, including Dirty Heel (2008), and various photographs that address Minter's interests in feminism, fashion, and celebrity. Included are the photo series Coral Ridge Towers, completed in 1969; Little Girls #1 from 1985, part of the artist's monumental series Big Girls, Little Girls; and the painting Blue Poles of 2007. Note: Access to the exhibition is restricted to visitors age 18 and older. A monograph (Gregory R. Miller & Co., May 26, 2015), featuring an interview with the artist and more than 60 color and black-and-white images, is available. Read Daria Daniel's interview, "artnet Asks: Marilyn Minter Calls Herself a Photo-Replacer", April 12, 2015. ✭ Minnesota-based Julie Buffalohead (Ponca Tribe, Oklahoma) is exhibiting in a mid-career survey at Plains Art Museum, Fargo, North Dakota. Her show, "Julie Buffalohead: Coyote Dreams", features drawings and paintings that use narrative imagery from myths, fairytales, Native culture, and personal experience to challenge stereotypes of Native Americans. Approximately two dozen artworks from the early 2000s until the present may be seen in the exhibit, which continues through August 29. Read Mary Abbe's Star Tribune article, "Julie Buffalohead Tells Trickster Tales with Her Art", March 5, 2015. ✭ Virginia's Taubman Museum of Art, in Roanoke, has mounted a show of the photography of Audrey Flack. "Transient Beauty: Photographs by Audrey Flack", continuing through September 19, and drawn from the museum's permanent collection, features a first look at a series of Flack's dye-transfer photographs from 1983. In addition to photography, Flack is a painter and sculptor. Her work is found in museums around the world. Read an oral history interview with the artist at Archives of American Art.